Hunter Green is staring at a blank sheet, scratching his head in despair. Sure, he could write another comprehensive guide. Or he could write another list with tips. But frankly speaking, the idea makes him want to puke. It’s not that lists and guides aren’t useful. His readers seem to read and love his posts. But Hunter wants to write something different. Something fresh. Something original. Something more valuable than usual. Something that makes his readers deliriously happy. What the heck can he write for his blog? Even the most experienced bloggers get stuck in a rut sometimes. They may have been churning out valuable post after valuable post. But at some point, their brains start creaking and the words stop flowing. Their writing machine has come to a complete standstill. Feeling stuck in a blogging rut, too? In this post, you’ll find 17 blog writing prompts. These aren’t creative prompts for personal journal folks. These writing prompts are for business bloggers, and they work in any industry or niche. Even more importantly, these ideas are proven to work, delighting readers and generating ridiculous numbers of social shares. Writing lists with tips is great. We know they’re popular and get loads of shares. But which reader doesn’t feel overwhelmed with everything he’s supposed to do? If I’d follow all the 101 ways to promote my business on Pinterest and the 99 ways for sharing my blog posts, I’d never get another blog post written. So, for a change, write the antithesis of the list post: Share only your best ever tip and inspire your readers to implement it. For example, the post My Single Best SEO Tip for Improved Web Traffic by Cyrus Shepard was the third most popular post on Moz.com last year, generating 9.3k social shares. What is your single best tip? What’s the easiest way to solve a problem for your blog readers and improve their life? Many bloggers simply regurgitate other people’s ideas. So a simple way to stand out is to dig into the science behind your topic. Which research can you share? What are the newest findings? For example, the article A Science-Backed Guide to Taking Truly Restful Breaks by Christian Jarrett was the sixth most popular post on 99U last year, generating over 4.1k shares. Integrating science into my writing isn’t my strongest point, so it’s something I’d like to try to do more this year. What about you? How can you integrate research into your content? 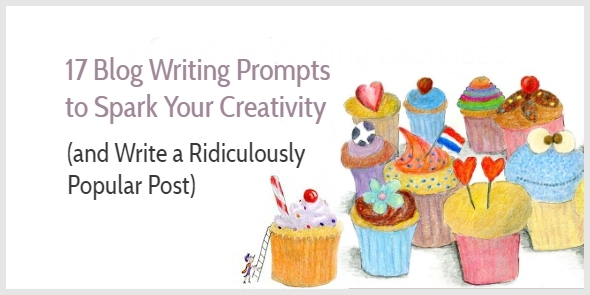 Have you noticed I’m including examples for each of these blogging prompts? Readers love examples because they show how advice can be implemented. Examples inspire and motivate. They spark creativity. For instance, my post with headline examples was my second most popular post last year, and this beautiful post with 15 Examples of How Street Art Can Transform The Place was the fifth most shared post on Demilked, generating over 24.7 social shares. Can you inspire your readers with a series of examples or case studies, too? A post about yourself doesn’t need to be a self-absorbed rant or whine. Instead, view your story as a case study to inspire your audience, an example of a universal lesson. The article How I Built an Online T-Shirt Business and Made $1,248.90 in 3 Weeks, for instance, was the most shared post on Shopify in 2015, generating 9.6k social shares. My post How I Learned to Be Me (Finally, at 47 Years Old) generated the most comments in 2016. Which problem have you recently overcome? Can your lessons inspire your readers, too? How would you love to change your readers’ lives? An open letter is an opportunity to help readers overcome one of their biggest hurdles. For example, An Open Letter to Those Who Have Lost Their Motivation by Marc Chernoff was the most shared post on MarcandAngel.com, generating 53.8k social shares. Perhaps I should write An Open Letter to Those Who Think Their Writing Isn’t Good Enough. What do you think? Quotes are hugely popular, because they summarize profound wisdom in only a few words. Quotes can comfort readers, or make them stop and think. Quotes are also great for creating visual articles. The collection of 100 Inspirational Quotes That Summarize the Wisdom About Life, for instance, was Lifehack.org’s most shared post in 2016, generating a staggering 3.1 million shares. I’ve started working on a hand-illustrated collection of quotes about writing (follow my progress on Instagram). Are your readers looking for the most comprehensive and definitive guide on your topic? According to research at Moz.com, none of their readers wants another ultimate guide. So, what can you write instead? The article How to Knit a Huge Blanket in 4 Hours was the tenth most popular post on TipHero in 2016, generating a crazy 135k shares. Which bad habit is bugging your readers? And how have you beaten your own bad habits? Research has shown we all struggle with keeping to our new year resolutions. So how did you manage to stop smoking, kick your Facebook addiction, or quit eating sugar? Michael Hyatt’s post Why I Stopped Watching Television News was his second most popular in 2016, generating 2.1k shares. Which bad habit did you beat last year? Or which bad habit are you planning to beat this year? Can you record your story? If you don’t like to share your own story, you can write a “stop” guide instead. For instance, How to Stop Losing Your Temper With Your Kids was the most shared post on the Kids Activities Blog, generating over 58k social shares. Want to stir up a little controversy? Or bust a myth? Or share an uncomfortable truth? The provocative question I might write about: Is Your Writer’s Block Just a Bad Excuse? How often do you google a question? Answering burning questions on your blog is a smart strategy. Firstly, your answer helps readers. Secondly, your post can generate a ton of search traffic because people google questions all the time. Moz.com uses this strategy regularly. Their most popular question in 2016 was: Can SEOs Stop Worrying About Keywords and Just Focus on Topics?, generating over 7.1k social shares. If I have cancer will I die? Why don’t I enjoy life? Why is Frozen so popular? Lisa Gabbert has written an excellent guide on finding questions to drive SEO traffic for WordStream. Or how does the world news effect your business? David Meerman Scott coined the term newsjacking as a way to grab attention of your audience by taking attention of breaking news. But you don’t even need to piggyback on breaking news to write a popular post, and you don’t even have to comment on politics. For instance, Aaron Orendorff created an in-depth analysis of the online marketing campaigns of Clinton vs Trump. His post Clinton vs. Trump: A Presidential Marketing Campaigns Teardown was the most popular post on Unbounce in 2016, generating over 7.1k shares. Want to spark your reader’s creativity? A list with ideas is a bookmark-worthy resource. Readers don’t have to implement all your ideas in one go; they can dip back into your list when they need a fresh dose of inspiration. For instance, 15 Indoor Garden Ideas for Wannabe Gardeners in Small Spaces was the second most shared post on Apartment Therapy, generating over 100k shares. Note how specific this post is. It’s not a general list with garden ideas, but a list specifically for wannabe gardeners who don’t have a lot of space. Which ideas could inspire your readers? Who doesn’t like a good checklist? Checklists are valuable content because everyone is afraid to miss important tasks when completing a project. Also, checklists can help beginners get to grips with a task they’re unfamiliar with. Unbounce’s third most popular blog post in 2016 was A 34-Point Checklist for Creating a Case Study that Converts (by Ayelet Weisz) which generated over 3.1k social shares. My 61-Point Website Checklist is one of my all-time most shared posts. What checklist would be helpful to your readers? What stops people from implementing your advice? We all have objections to doing things. Perhaps we want to talk about politics at work but are afraid to alienate people, or we’d love to work remotely but are afraid to lose motivation, or you want to keep writing but feel like a fraud. One of the most popular posts on Prevention.com was How to Do Squats And Lunges Without Killing Your Knees, generating over 12.1k shares. How can you overcome the “but” in your readers’ mind? The tiny topic is one of favorite blogging techniques. Tiny topics are great for readers because they get actionable and specific advice. And for bloggers it’s relatively easy to generate an endless stream of tiny topic ideas. To generate ideas for tiny topics, break a general question down in more detailed questions (see here). Then use my tiny topic approach to write a valuable post (see here). Posts with predictions tend to be popular. But how can you make such a post interesting and avoid writing the same post as everyone else? You don’t have to wait until the end of the year to publish your predictions. 99U published The Future of Design (and how to prepare for it) in July 2016, and the post became their third most popular of the year (4.9k shares). Perhaps I could write a post about the future of online writing. And you? What will you write about next? When you pick an idea for your next blog post, first think about your readers: Would the article be helpful to them? Then ask yourself: Do I feel excited about writing this post? Most writers write their best content when they feel enthusiastic. So write for your readers. But also, write for yourself. I used BuzzSumo to research this post. As I did most of my research in the past week, the figures quoted include social shares in January 2017. Also, I might have missed a popular post if it was published early January 2016 as BuzzSumo’s figures go back for one year only. Thank you for stopping by, Peter! Your posts are always enchanting. This post along with headline examples post are really epic. I have never been able to ignore your email or post without reading it a couple of times. Just reading your blog, your snackable course and your ebook from kindle have helped me to improve my writing. What I have learnt is that improving my writing is a constant process. Initially, I used to dread the blank page and my keyboard felt like a typewriter. But now after reading your post after post, I am able to get better. I will share my work with you over email. Thank you for helping me to write better. What a lovely comment. Thank you, Amit. I’m happy to read my content is helping you become a better writer! This is a timely post because I have ‘plan more newsletter topics’ on my To Do list this week. And I hate massive list posts and the like, find them an utter turn-off to write even though I know they often get s lot of social shares! So while #14 is my least favourite item in this post, I love your suggestions about ‘my top tip’; the doable checklist; the tiny blog post and the ‘use science ‘ tip. I also like the encouragement to write about things I am passionate about… that helps me generate the energy I need to stay consistent with blogging. Thanks Henneke, this post must have taken a lot of research time. It’s a valuable one for me. And yep, you’re right this took a lot of research time. To be honest, the research was quite interesting – I lost track of time, so I didn’t mind it. It gave me some new ideas, too. Thank you for stopping by again, Alison. Always good to see you! Terrific post! This has probably something for everyone no matter what niche you are on, no matter how big their blog is. Don’t you think this is all for the big players? No matter how definitive a guide you write, what effort you put it, how meaty you make it, it will only grow as bi your audience is? I don’t want to sound negative but I am asking what I am seeing on my blog. For example, I have written this 4000+ word guide on on page SEO (https://www.digitalgyd.com/on-page-seo-techniques/ feel free to remove the link if that’s not okay) and I have not seen half the success or even 1/1oth the success these big players get for publishing a mediocre article on the subject. Yes I am pointing out t publishing houses like Forbes that do not have good content, updated content and still outrank us deserving bloggers? Since it doesn’t rank, we don’t have readers as much and so small amount of social shares too. My point of raising this question was to get solution and get pointed out if I am missing anything of the secret sauce that I should be using. I’d be very glad if it gets solved. I’m not really an SEO expert, so I find it hard to advice what you should do in your situation. One option is to actively ask for links to your content. This is what Brian Dean advocates with his Skyscraper approach. This is something I’ve never done for my blog posts as I rather write articles than cold emails. So what I do is primarily write for my readers, not for SEO. I still get a ton of search traffic, because I’ve got some good links from my guest posts and some of my readers regularly link to my site. Enchanting Marketing is also an extremely focused blog and I write a lot of in-depth posts about tiny topics (or long tail key phrases as some might say) which not many people cover. I also have good internal linking. This approach has worked well for me. Still, I also see mediocre content ranking above my articles, too. Often these sites have been around for a much longer period and are simply benefiting from the quality perception they’ve built up over time. But with some more time, I’m sure I can outrank them for more and more key phrases. The tips above aren’t just for the big players. My approach is to write valuable content for my readers. In the end, that’s what Google wants us to do. I also make sure that I don’t write more posts about the same topic twice, so my own blog posts don’t compete with each other (my guest post do compete with my own blog posts in Google). Thanks for being kind and replying to my query. It was haunting me from quite a while and you just relieved me off it. Getting links is really important, even I feel so. With links you can prove Google that you are an authority. I’ll try to gather more links via guest posting maybe? Writing for readers is the key I guess. I’ll try to do that. I try to solve questions that most of my readers/audience face and will keep doing that. Target ting long tail keywords is also a great tip, thanks! Thank you again, I always ask my queries and you are there to help me! This couldn’t come at a better time for me. All the resources in this post are incredible. And yes, you should write an open letter. 🙂 As well as everything else you’ve suggested. Your drawings on Instagram are an absolute joy. Thanks for a great list Henneke. One of my goals this year is to write every day. Having a list of prompts is really helpful. I have a collection of these now and dip into them for ideas when I don’t have anything specific planned. These are all valuable and doable ideas. I’m setting my sights on the rallying cry as it fits with a theme I have going. That sounds great. I’m already curious to see what you’re rallying cry will be about! Thanks, Henneke. That was really helpful for everyone especially for a beginner who just started. Thanks for writing such a beautiful and informative post. Ideas really helpful. I’m glad you’re finding these ideas helpful, Dmitry. Happy blogging! Thank you! This arrived at precisely the right time for me – as so many of your blog posts seem to do. What a resource Henneke. You spent many hours creating this and each of your readers now has many hours they can spend delving into each of these ideas and following the links to all the research you did. Brilliant! A great way to start the new year. Maybe it is a list post, but certainly a much more creative and useful one! I can always count on you to have a new approach and not follow the herd mentality. Oooh! So many wonderful ideas to get a jump start on in time for the new course/coaching offering. So this post is a nice snack to tide me over for the ACTUAL registration on Thursday. Such a great list for brainstorming new ideas. Perfect timing for me. Thanks for sharing so many “doable” ideas. Great! I’m get it came at the right time. Happy blogging, Stephanie! Looking forward to your article for those who think their writing is not sufficient enough. One thing I have found that helps is to write every day. In my case, it’s a newsletter. Recently, I had an experience where the words just came to me and were typed out; the response to the post was remarkable. I wish I could somehow do this on demand, but it does not seem to work that way. I think a regular schedule makes a huge difference. I’ve never been able to write really every day, but posting at least once a week keeps my writing muscles quite lean. For a while, I tried writing every other week and it just didn’t feel right. I got rusty. I’d say, over time it becomes easier to write on demand. This is brilliant. Well done Henneke – enough to get anyone out of ‘foggy bottom’! Thanks for the mention too. Thank you for stopping by, Sonja. Happy blogging! This post will come in very handy because I’ve dedicated to write every day to my site. Hopefully, I can report back to you soon on how it’s helped! I’m glad you find it useful, David. I appreciate your comment. Wow ! This is so timely. Thanks for such a wonderful post, Henneke! You’ve given me lots of ideas. I think you’ve given me more than enough fodder for the year. I’m enchanted and inspired as improving my writing is one of my main goals for this year. Thanks Henneke for these actionable options. Btw, you’ve done a fabulous job incorporating your own advice. Hey Henneke – I loved these! Over the past few months, I’ve been experimenting more with the “backed by science” prompt and have really enjoyed it. I’ve been digging into books that have lots of scientific data to prove a point (i.e. Malcolm Gladwell, Adam Grant style have always loved this format), and I’m pleased with both the reception and even my enjoyment level with it. I’ve seen quite a few headlines with either the phrase “backed by science” at the end or the phrase “Science says” at the start of the headline. It does seem to be quite popular. The best catalog of options to choose from! I’ve printed a list of these 17 and it’s going up on the wall in front of my desk. Thank you, Syed. What a lovely comment. Happy blogging in 2017! Your posts are always so timely and well thought out. I got really excited reading these writing prompts. Can’t wait to start writing. You rock! Hi Tomie – great to read that you’re getting excited about these prompts. Happy blogging! Fantastic, it amazes me how you never run out of “juice.” Better still, you share it in a way that it makes it sound so easy and doable. Please do the open letter, that would be splendid. Please *10^23. Also, integrating research into content is a great pointer. I do run out of juice sometimes. That’s why I took a break from my blog in December. But I always bounce back. There’s still so many things that fascinate me about writing and that I can share. I hope this is not a silly question, but … what does *10^23 mean? Thank you for your lovely comment, Bernice. I appreciate it! Aw, Henneke, another post I must bookmark! I cannot thank you enough for this one! It’s going to make a tremendous difference. Yes, I don’t use the word “proven” often, but I found it okay to use here as I saw that these types of posts were doing well, not just on one blog but on more than one blog. I am fan of your blogs such a all blogs are too good.Your blogs wording are very understandable. Your ideas are awesome. Thanks for sharing these amazing and informational ideas. Thank you, Josephine. Happy blogging! Hands down the best post I’ve read in 2017 so far. I love your point #1 with that list post thing. I’m definitely going to try that. It seems that might work because 101 ways to do anything is very overwhelming and most people will not implement any one of those tips. Wow. I’m really blown by this. And the part about doable guide instead of definitive ones is very smart. If people see a time frame linked to something that automatically steers their thinking to ‘I can do that too’. I’m so glad you liked this post. I did my best to come up with fresh, non-mainstream ideas so there’s something new for everyone, but I still wanted ideas that have been proven to work. I’m glad you found two ideas to implement. 🙂 Happy blogging, Andrew! “Do I feel excited about writing this post?” This is a great question. Usually, when I’m not passionate about topic, my writing tends to be pretty boring. Thanks for a great post! Love your blog! I feel exactly the same. If I’m not excited about a topic, it’s hard to put energy into my writing. Thank you for your lovely comment, Jessica. You’ve given me so much to digest here! I’ve only just started my blog so I’m yet to really implement any of this but it’s at least going to help get me going in the right direction! I’ve bookmarked this article so I can keep coming back to it. Thanks! Great! I’m glad to hear that, Gia. Happy blogging! That’s lovely to read. Thank you, Anuradha. I smiled that “The antithesis of the list post” was the first idea in a list. 🙂 In all seriousness, I appreciate the ideas to break out of the mold a little bit. Ha yes! This, of course, IS a list post rather than it’s anthithesis. Your articles tips are fantastic help for all interested in refining and enlightening their writing. Thanks for your help, keep coming. I’m glad you’re finding my blog posts useful, Jorge. Happy writing!